Pinky was rescued as a puppy by Animal Rescue Fund of MS (ARF). She had a severe case of sarcoptic mange, which caused her to have horribly inflamed, “pink” skin and no hair. For the next 2 years of her life, Pinky lived on the ARF Farm, waiting for a family. However, a family never came to adopt her. 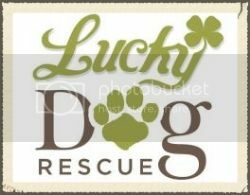 Then, a couple of months ago, a Pit Bull breed ban (BSL) in Rankin County, Mississippi forced Pinky and 5 other Pit mixes to be transferred from ARF to Lucky Dog Rescue in Meridian. 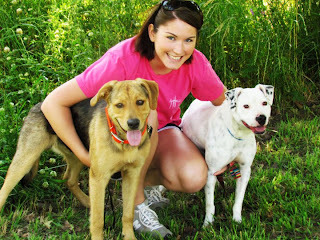 My friend, Jaymie, contacted me last week to inquire about fostering one of my rescue dogs. My heart was so happy. 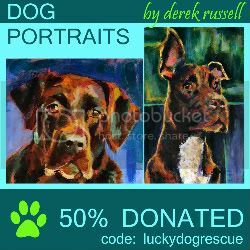 If you want to make my day, offer to foster one of my dogs—and mean it. 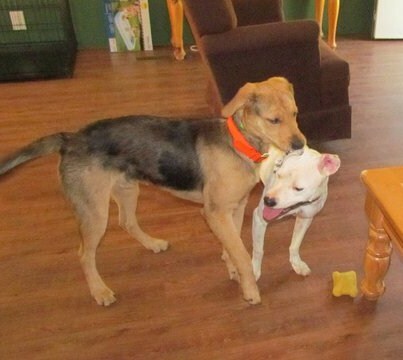 Jaymie has one male dog named Jeff, and she wanted to find a foster playmate for her pup... while also giving a rescue dog the chance for some special love and one-on-one time in her home. I immediately thought of Pinky... my sweet, special girl, who’s never had the chance to live in a home and have a family. I knew that the foster experience would mean the world to her. Yesterday, Jaymie and her dog, Jeff, came to visit Lucky Dog Rescue to meet Pinky. My little Pinky-girl didn’t know it at the time... but she was meeting her first foster family. Last night, Pinky went “home” ... for the first time in her 2-year-old life. After she left, I sobbed tears of joy for her. There’s nothing like seeing one of your babies get the chance at having a family. Foster or not, it’s the first real family life she’s ever known, and they truly changed her life yesterday... by opening their home and their hearts to a girl in need of love. A few weeks ago, I found Ashley Owen Hill’s facebook page, and I secretly began to stalk her profile and her blog (sorry Ash). Seeing her passion... set fire to my soul. After talking it over with my boyfriend, we decided to become a foster family for one of Ashley’s rescue dogs, until the pup could find their forever home. Why did we come to this decision? 1) Our dog, Jeff, loves, loves, loves the company of other dogs. 2) It would help take some of the burden off of Ashley. 3) It was the perfect way for me to help a precious soul, who truly needs some extra-special love and attention. Yesterday, we met our first foster dog, Pinky, and we brought her into our home. 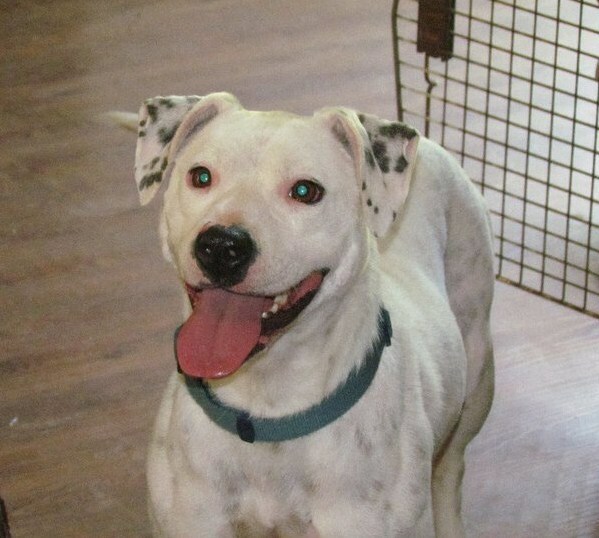 At 2 years old, Pinky has never been in a home environment. She’s never known what it was like to have all the love and affection to herself... always being one of many other dogs. For the first hour, the lights, the ceiling fan, the refrigerator cutting on… every little thing spooked this sweet girl. She just wasn't quite sure what to think of all this... or of us. But she's a smart pup and a quick learner. A couple of hours in, she started to feel safe. She laid down on the couch and even watched a movie with us. She had the best time playing with our dog, Jeff, and they’ve become fast BFFs. She loves her crate with the comfy bed we bought for her. It makes her feel very safe. I decided to be brave and leave her crate door open all night. Pinky did perfect. She didn't mess anywhere in the house, and she didn't tear anything up! She’s such a good girl! Today is Day 2, and she's already made a huge improvement. As the hours press on, I'm seeing more and more of this girl’s sweet, quirky personality. Her favorite thing is to run-off with the clean laundry as you’re trying to fold it. She'll run circles around the house... just to keep it from you. It’s her way of playing a fun little game, saying “You want your clothes? Then you better catch me!! !” But as soon as you turn your back and act like you don't care... she drops the clothing and walks away. It’s so funny to watch! My dog, Jeff, and Pinky are best buds. They sleep next to each other, eat and drink at the same time, play tug of war with the rope toy, and wrestle almost nonstop. It melts my heart to see this girl so happy. When she looks at you, her eyes say it all. You can tell she's so very thankful for everything Ashley and ARF did to save her. She's truly an ambassador for rescue dogs. Making the decision to foster a rescue dog is the best decision we’ve ever made. I didn’t know my heart could be so happy, and this experience has touched our lives more than we knew possible. When you bring a foster dog into your home, you intend to make a difference for them. But you don’t realize... the difference they’ll make for you. What a beautiful story, thank you so much for sharing! Foster families are fantastic, fantastic, *important* people- what you are doing makes such a big difference! I am so happy for Pink! Thanks to all of you for helping her so much, you rock. yeah for Pinky.....and everyone involved. 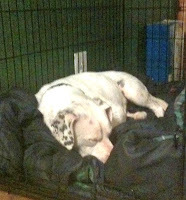 I fostered a pitbull in April.He was part of a transport from South Carolina....he had been saved at the 11th hour. I only had him one night before passing him on to the next transporter. But the experience was life changing. To share moments you know they wouldn't have in different circumstances is truly touching. I admit I cried when I watched him drive away on the next part of his journey. I wish him a happy life. Blessings to rescuers, fosters, transporters and adopters everywhere. It is only thru so many people doing a lot or a little...don't forget the sponsors and shelter volunteers...so much by so many...God Bless you all..
Well, it happened again! Tears! Happy tears though. I love stories like this. 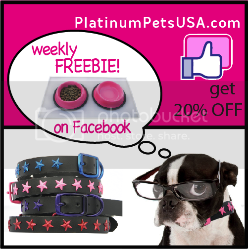 Thank you for sharing it and keep us posted on 'Pinky & Friends'! Hooray for fosters! It's the toughest job you'll ever love. Thank you Ashley & Jaymie for everything you've done for Pinky. I've known her since she first came to the ARF Farm with no hair. She was always a favorite at the farm, and it nearly makes me cry to see how well she has adapted to having a family! Ashley, you truly are an inspiration! I'm so glad Pinky has finally been given the chance to know what it's like to be part of a family! These are the best stories, they really do help me get through the day. Congrats to Pinky and the family lucky enough to open their doors to a wonderful pup. I met Pinky today... I am her new 'Granny' and I love her already! She is so sweet and friendly. She gave me a kiss. A beautiful dog with a big heart. She has a good foster home with my son and future daughter-in-law. 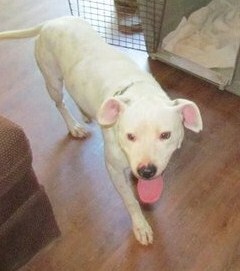 I hope they will adopt her into the family because I want to know she has a safe and loving forever home! 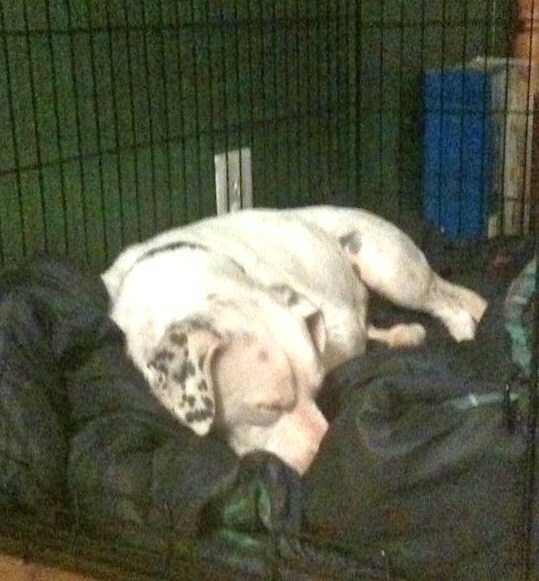 We are so blessed to have the opportunity to give Pinky a temporary home. She has already shown me so much in the few hours she has been with us. God Bless this precious soul. What a wonderful story! Keep doing what you do... These dogs need rescuers, and despite the heartbreak that comes from the ones we can't save, it's always so rewarding to hear about happy journeys, and happy endings.